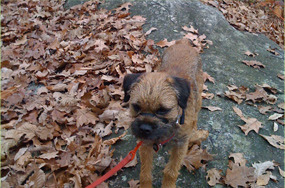 Dogs love Haddam trails too! Just be sure to keep them on leash so everyone can have a safe and happy experience. 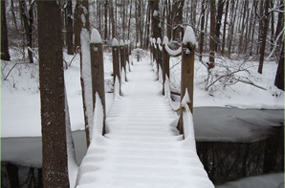 Hiking is a year round activity in Haddam, as shown in the winter wonderland photo by Halden Block. Initial funding for this site was provided by the Higganum Vision Group www.higganumvisiongroup.org through a grant from Rockfall Foundation, Middletown, CT. www.rockfallfoundation.org. For driving directions to this trail, click here. 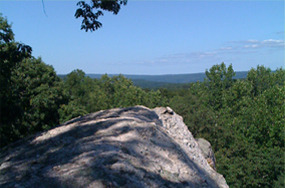 For more information on use of this State Park Click Here. Miller’s Pond is a scenic, quiet lake without a boat launch or beach. Numerous rock outcrops reach out into the pond to provide fishing platforms. An easy, flat trail circles the lake, although it is a little rocky in places, so shoes should be worn while hiking. 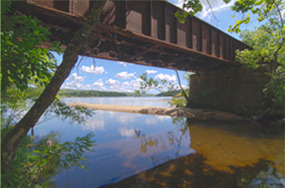 Millers Pond was acquired in 1955 by the State Park and Forest Commission from the heirs of Thomas Macdonough Russell with monies provided in the trust fund of George Dudley Seymour. 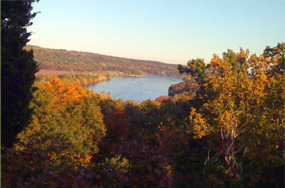 At that time the park consisted of 30 acres of pond and 170 acres of wooded land in the towns of Durham and Haddam. In succeeding years the state purchased additional property, completing acquisition of all the land around the pond in 1972. Millers Pond is unique in that its principal source of water comes from large springs which create a body of unpolluted water excellent for small mouth bass or trout. The original dam at the pond was erected some time before 1704. Thomas Miller built the upper dam to provide a reservoir to serve his gristmill further downstream.